Copyright © 1996 by Aletha Solter. All rights reserved. No part of this article may be reproduced or transmitted in any form or by any means, electronic or mechanical (including copying to other web sites, and including translations), without written permission from Aletha Solter, with the exception of printing pages for personal use and for free distrubution to parents. 1. LOOK FOR UNDERLYING NEEDS. Example: Give your child something to play with while waiting in line. 2. GIVE INFORMATION AND REASONS. Example: If your child colors on the wall, explain why we color on paper only. 3. LOOK FOR UNDERLYING FEELINGS. Acknowledge, accept & listen to feelings. Example: If your child hits his baby sister, encourage him to express his anger and jealousy in harmless ways. He may need to cry or rage. This is sometimes easier than trying to change the child. Example: If your child repeatedly takes things out of the kitchen cupboards, put a childproof lock on them. Redirect your child's behavior. Example: If you do not want your child to build a fort in the dining room, don't just say no. Tell her where she can build one. 6. 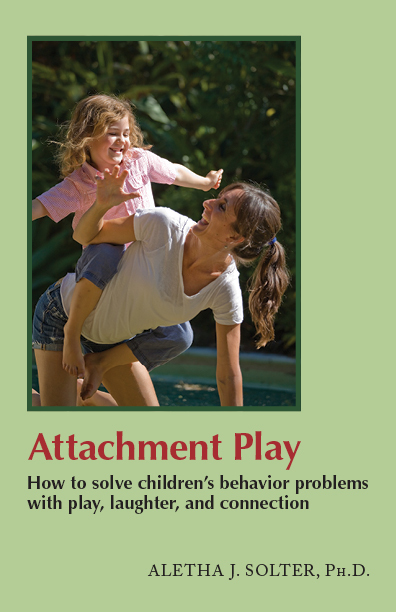 DEMONSTRATE HOW YOU WANT YOUR CHILD TO BEHAVE. Example: If your child pulls a cat's tail, show her how to pet a cat. Do not rely on words alone. 7. GIVE CHOICES RATHER THAN COMMANDS. Decision-making empowers children; commands invite a power struggle. Example: "Would you like to brush your teeth before or after putting your pajamas on?" Example: "I'll let you skip brushing your teeth tonight because you are so tired." 9. PROVIDE FOR A PERIOD OF PREPARATION. 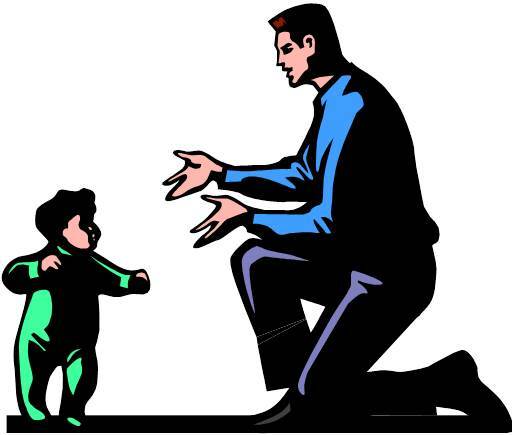 Example: If you are counting on company for dinner, tell your child how you expect him to behave. Be specific. Role-playing can help prepare children for potentially difficult situations. 10. LET NATURAL CONSEQUENCES OCCUR (when appropriate). 11. COMMUNICATE YOUR OWN FEELINGS. Let children know how their behavior affects you. Example: "I get so tired of cleaning up crumbs in the living room." 12. USE ACTIONS WHEN NECESSARY. Example: If your child insists on running across streets on your walks together, hold his hand tightly (while explaining the dangers). Children who are acting aggressively or obnoxiously can benefit from holding, in a loving and supportive way, that allows them to channel their pent-up feelings into healing tears. 14. REMOVE YOUR CHILD FROM THE SITUATION AND STAY WITH HER. Use the time for listening, sharing feelings, holding, and conflict-resolution. 15. DO IT TOGETHER, BE PLAYFUL. Many conflict situations can be turned into games. Examples: "Let's pretend we're the seven dwarfs while we clean up," "Let's take turns brushing each other's teeth." 16. DEFUSE THE SITUATION WITH LAUGHTER. Example: If your child is mad at you, invite him to express his anger in a playful pillow fight with you. Play your part by surrendering dramatically. Laughter helps resolve anger and feelings of powerlessness. 17. MAKE A DEAL, NEGOTIATE. Example: If you're ready to leave the playground and your child is having fun, reach an agreement on the number of times she may go down the slide before leaving. Discuss ongoing conflicts with your children, state your own needs, and ask for their help in finding solutions. Determine rules together. Hold family meetings. Young children have intense feelings and needs and are naturally loud, curious, messy, willful, impatient, demanding, creative, forgetful, fearful, self-centered, and full of energy. Try to accept them as they are. 20. TAKE A PARENTAL TIME-OUT. Leave the room and do whatever is needed to regain your sense of composure and good judgment. Examples: call a friend, cry, meditate, or take a shower. 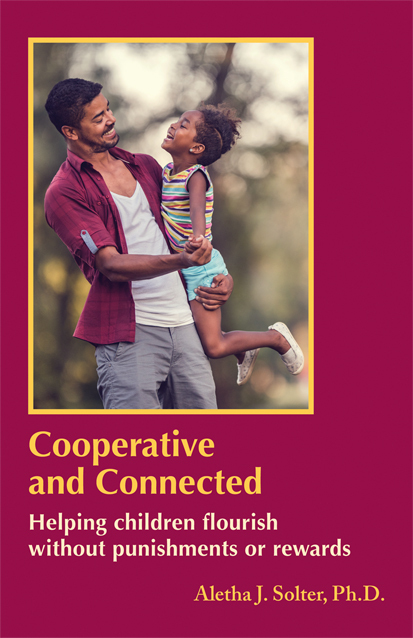 For more information about non-punitive discipline, see Aletha Solter's books, Cooperative and Connected and Attachment Play. This page was last updated on October 29, 2018. Copyright © 1996 to 2018 by Aletha Solter. All rights reserved. No part of this article may be reproduced or transmitted in any form or by any means, electronic or mechanical (including copying to other web sites, and including translations), without written permission from Aletha Solter, with the exception of printing copies for personal use and for free distribution to parents. A previous version of this article was published in Mothering Magazine, Vol. 65, 1992. Warning/Disclaimer: The information in this article is not intended to be used as a substitute for medical advice or treatment. When children display emotional, behavioral, or medical problems of any kind, parents are strongly advised to seek professional advice and treatment. Some of the suggestions in this article may be inappropriate for children suffering from certain emotional, behavioral, or physical problems. Aletha Solter, The Aware Parenting Institute, and Shining Star Press shall have neither liability nor responsibility to any person or entity with respect to any damage caused, or alleged to be caused, directly or indirectly by the information contained in this article.